Guests will love these cozy tree houses. Perfect for families and friends, they are set on an adventure resort in Wisconsin Dells, Wisconsin. Inside, there are accommodations for four, with one comfortable queen-size bed and one set of bunk beds. All linens and towels are provided. Bathroom and shower facilities are a short walk from the rentals. While staying at the property, guests will have access to both an indoor and outdoor water park and a theme park. There is also access to saunas and whirlpools and the kids can get their energy out playing tennis, basketball, and volleyball. For those looking to bring their boat, there is private boat docking access. Throughout the property there is Wi-Fi and guests have plenty of parking. Guests will also have tea and coffee-making facilities. 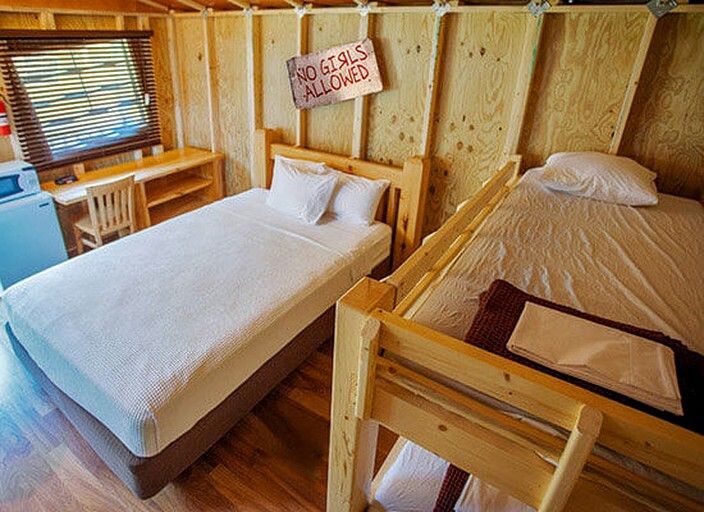 The cabin has Queen Bed and Bunk-beds with bedding and towels. The showers and restrooms are a short walk from this unit. Summer Specials Include free tickets to Noah's Ark Waterpark (Good 5/26/18 to 9/03/2018) & Timbavati Wildlife Park (Good 5/01/18 to 10/28/2018) complimentary with your stay. Guests don't need to travel far to get the most out of the area. With access to water parks and the zoo, everyone will be entertained for hours. There are also courts on which guests can play tennis, basketball, or volleyball. Within a few miles, guests will find all the local shops, attractions and restaurants needed. Nature lovers can head to one of the state parks such as Devil's Lake, where there are great hiking opportunities and spectacular views.